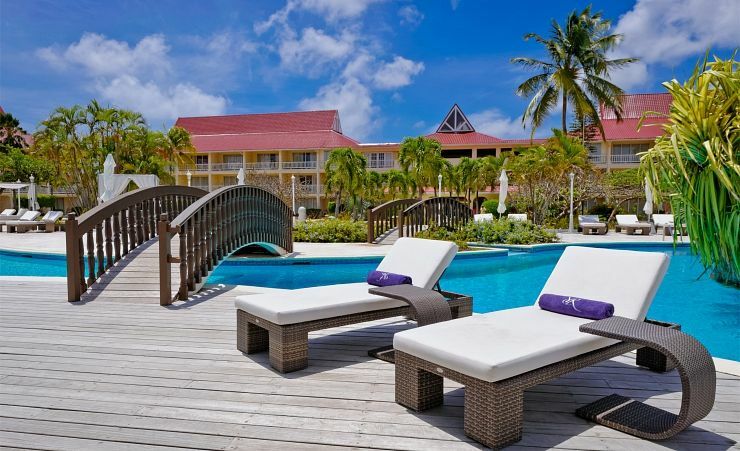 The Royal Resort & Spa, part of the Rex Resorts chain, offers a peaceful and deluxe location aimed at ensuring your stay is as relaxing as possible. The highlight of the Resort is its onsite Spa, the Spa at Royal Resort, which offers a wide range of treatments and therapies for you to get into the holiday feel. Situated directly on Reduit Beach, the hotel offers direct views of the majestic North Atlantic Ocean. The Royal Resort offers a range of amenities for you to take advantage of during your stay including two restaurants serving up a range of delicious meals. The resort is also conveniently close to the Saint Lucia Golf Club, which is just 3km away. All suites come with luxurious bathrooms including a shower as well as a separate bath, along with private patios. Wi-Fi and air-conditioning are included in all suites. Also included is a minibar, refrigerator and Satellite TV.